In this podcast I’m going to talk about a trip I took to the Cotswolds in the UK which was a walking tour across the English countryside. I also invite a special guest to the podcast – Becky! First off, how did I decide to take a walk in England? To prepare for the trip was not too much different than a normal trip out of the USA. Our passports were ready but we needed a few extra pieces of gear. We did some physical conditioning to get in shape, mostly just walking, but as you’ll hear, Becky wasn’t quite prepared for the mileage that we did on our particular route. My impression of Contours trips based on my one experience is great. The way this works is that they plan the route on walking paths, book your accommodations along the way, and have your luggage transported for you every day. They also give you some very detailed printed route instructions, and a topographic map with the trail highlighted. 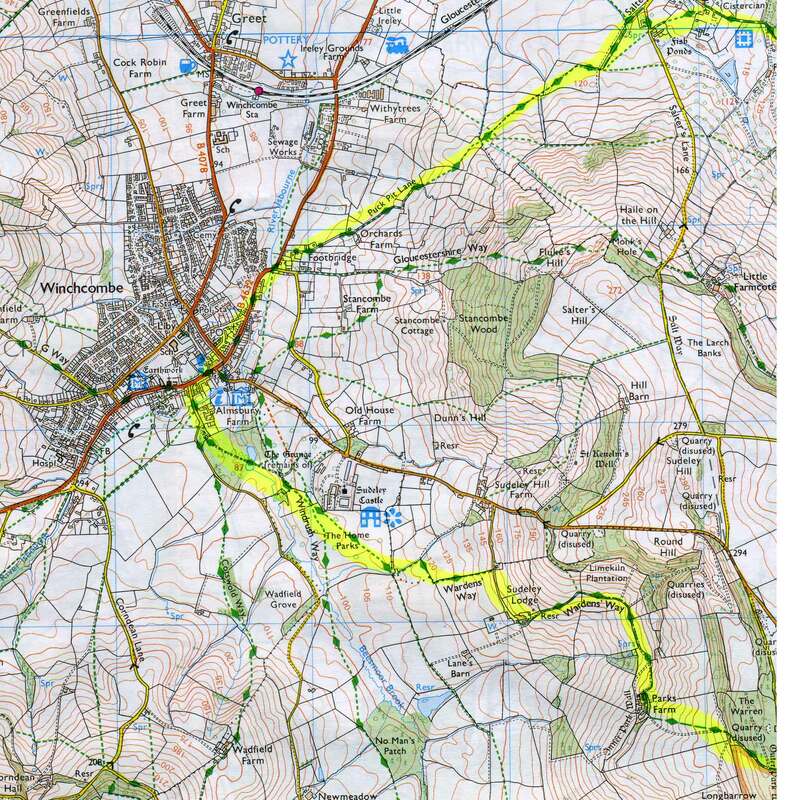 I’ll put up scan of the highlighted map. They put this all in a nice packet with emergency numbers, village maps, and all kinds of information you might need. The accommodations are planned and booked for you in B&B’s or small Inns with your luggage waiting for you, so all you have to do is hike with whatever you want to carry along for the day. This is the first trip when I really started writing in my travel journal. I’ll read the journal entries on the podcast. Our route averaged 13 miles each day. You can choose different routes with less mileage or more rest days in between, but since we are Americans and had only a short amount of vacation time to spend, I thought we would be ambitious. If you do one of these trips you need to be in shape and know that you are going to be walking right through fields with sheep and cows in the field with you. You’ll go right through farmer’s fields with crops planted and the trail will cut right through the middle. 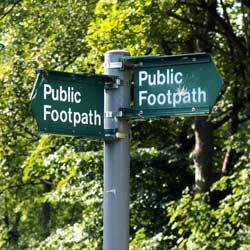 A wikipedia article about Rights-of-way in England. There are all kinds of ways to get in and out of the fields that outsmart the livestock. The two most popular are the stile and the kissing gate. A stile is just a step built into the fence that allows you to step up and swing your leg over the fence – to a step built on the other side. The kissing gate is a swinging gate where you have to step inside two posts and swing the gate to the opposite post before walking through. It’s simple enough for humans, but complicated enough to outsmart sheep and cows. The village we stayed at that first night was Bourton-on-the-Water. The buildings are all made of the yellow Cotswold stone. The River Windrush meanders through the center of town, with man-made stone banks and low stone bridges. In fact it is called the Venice of the Cotswolds. 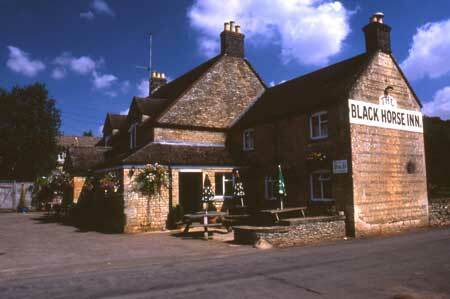 For some reason the Black Horse Inn and pub is something I remember. Maybe it’s because the pint tasted so good, or maybe because I took a picture of the outside. I remember walking in from the brightness outside to a room with low beamed ceilings. The beams were old black hewn beams with white plaster in between. The walls had all kinds of stuff hanging from them like baskets, horse brasses and even drying herbs and flowers. There wasn’t anybody in there except for the bartender. She talked to us and we had a pint and took a little break. As for the woods that Becky though was creepy – she was right. It was like something out of a horror movie. It was a forest of big old looking trees with space between them but there wasn’t any noise. No birds or bugs. That was the creepy part, but it made it kind of cool. The Old White Lion Inn where we stayed that night dated back to the 1400’s and has been used as an Inn for most of that time. It was neat to think that we were staying in a place that was used as an Inn for travelers in the 15th and 16th Century. The floors were kind of crooked and uneven, the doorways were small, and unfortunately the shower was barely a trickle. We really needed that shower too. When we ate dinner in the restaurant, we were telling the waitress about our walking tour and she said that a lot of Americans come over to do these tours and can’t hack it so they ride with their luggage to the next town. I asked her if she had ever walked the tours and she said, “ Oh God no, I couldn’t walk all that way”. So much for the wimpy Americans, eh? All along the route there are churches in the villages. Because they are free to enter and usually quiet and empty, they make nice places to stop and rest while taking in some of the history and architecture. The funniest part of our journey, and the story Becky and I both laugh about today is the bull in the field. She helps me tell the story in the podcast. After we got back home Becky told everyone that she enjoyed seeing the countryside, but she wouldn’t ever take a walking trip like that again. That disappoints me a little, because I love to hike and I would do it again in a second, but I guess I’ll have to go on future hikes by myself or with other friends. At least now she says she can finally look back on the trip with good memories. I now have a Facebook page started at facebook.com/JourneyJournalOnline. I’d love to hear from you, so please tell me what you liked, or what you want to hear more of in the podcast. Until next time, Enjoy your journey!